Was Eddy Merckx ‘the greatest’, or is that a silly question? Who is the greatest cyclist of all time? Well….Eddy Merckx of course. That’s already been settled hasn’t it? End of conversation. The man himself was asked that very question in the Observer magazine recently and his answer was, ‘I don’t like it when people say I was the best ever. It’s silly. I am not the best ever. I was the best of my time. You cannot compare generations.’ Natural and understandable modesty you might say. Merckx has no need to self promote, his achievements do that for him. The status of ‘The Cannibal’ is unquestioned. And Merckx is right, of course, you cannot compare generations. In doing so you are comparing riders who were up against different levels of competition and used different equipment, nutrition, sports science, and even (dare I say) different drugs. 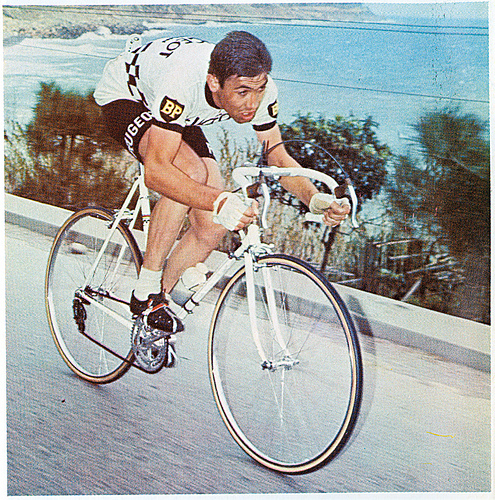 But for the sake of argument, how would Merckx fare in today’s hi-tech, highly analytical world of pro cycling. It’s tempting to imagine that the playing field might be levelled somewhat, with the main contenders in the pro peloton more skilled at maximising their form and ability and blunting some of Merckx’s prodigious talent. Perhaps he would win spectacularly and regularly but might not be quite as dominant as he was in his (and it is his) era. We can speculate, but that’s all. Merckx’s numbers are of course impressive – he racked up more than 500 wins during his decade of dominance – but during these years Merckx would compete all year long in the Classics, the Grand Tours and everything in between. He made his living from his sheer volume of racing – a workload that no modern rider is ever likely to carry again. A top pro today is paid comparatively well and doesn’t have to flog himself around Europe for the best part of the year to earn his money. On that basis it could be argued that no modern rider will even have the opportunity to bag so many wins – many pro riders today might not even ride 500 races across their career, never mind win them. 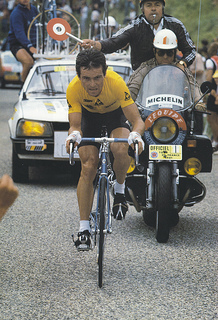 Even Bernard Hinault, another great all rounder and prolific winner, won fewer than half as many as Merckx. But the most compelling statistic which really does single Merckx out as the greatest is his win percentage. Across his career he won a staggering 35% of all the races he took part in, a figure which peaked at 41% for 1971 alone. Lets just spell that out…. he won more than 1 in 3 of all the races he took part in – a remarkable strike rate. So statistically there is a strong (if imperfect) case to say he is the greatest. Regardless of anything more subjective his numbers alone dwarf the competition, but thankfully it’s a question that we never really need an answer to. Some of us will happily take the statistics as gospel and worship at the alter of Merckx, others prefer to use more intangible measures perhaps rooted in nothing more than a grainy photograph, a glimpse of newsreel footage, a single improbable story of dogged bravery, a dramatic gesture or a moment of class. You could make a decent case for Coppi, the Italian star of the 1950’s with the film star looks, the turbulent life and a golden palmares. Maybe Anquetil’s your man? The hard-living-hard-riding Frenchman, almost as famous for his exploits off the bike as on it. Or perhaps you prefer Hinault? The tough Breton, ‘le patron’ of the Tour de France, brutal conqueror of Grand Tours and Classics alike. In the modern peloton, where there are fewer all-rounders and more specialists, what about Cavendish, Boonen or Cancellara? In cycling it’s about more than just numbers, it’s about improbable breakaways, dramatic crashes, rivalries, defeats, superhuman effort and all the other stuff of legend. The answer to the question ‘who is the greatest?’ is ‘Eddy Merckx’, but the stories that get you there are worth a listen and the supporting cast is stellar. To immerse yourself further in the history and the legends of pro cycling I’d recommend a visit to www.cyclinghalloffame.com. That’s really great to know, glad you’re enjoying it. Thank you.